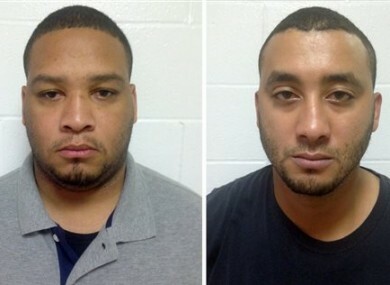 In this photo combination shows booking photos provided by the Louisiana State Police, Marksville City Marshal Derrick Stafford, left, and Marksville City Marshal Norris Greenhouse Jr.
INVESTIGATORS IN LOUISIANA are combing through evidence in the shooting death earlier this week of a 6-year-old autistic boy after authorities charged two law enforcement officers in the shooting. Colonel Mike Edmonson, in a late night press conference last night, said the two officers were being booked on charges of second-degree murder and attempted second-degree murder in the Tuesday shooting death of Jeremy Mardis and the wounding of his father, Chris Few, in the central Louisiana town of Marksville. It’s still unclear what led police to pursue Few and what triggered the shooting. The parish coroner said earlier this week that the officers were serving a warrant on Few when he fled, but Edmonson later said he had no information about a warrant. German added that the 6-year-old had been diagnosed with autism, describing him as a delightful child who “loved everything, everybody.” German said the boy had no siblings and the family had recently moved to Marksville from Hattiesburg, Mississippi. “I know a 6-year-old should not have been shot,” German said. Comments have been turned off on this article as it is subject to ongoing proceedings. Email “Two officers arrested after six-year-old boy shot dead”. Feedback on “Two officers arrested after six-year-old boy shot dead”.